Where is the food and produce you eat on a plane grown? 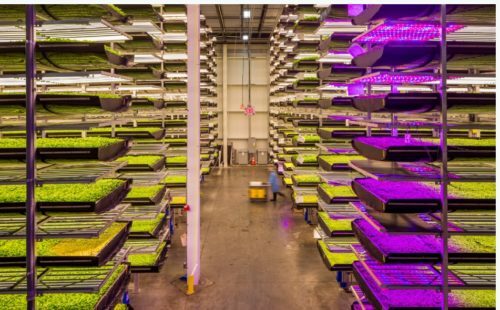 Singapore Airlines is working with indoor vertical farming company AeroFarms, which has reclaimed an abandoned steel mill in an industrial area near Newark International Airport and transformed it into a 1-acre, indoor vertical farm. The farm, which grows produce ‘aeroponically’ without soil, pesticides or sunlight, can produce the equivalent of 390 acres of locally grown produce with up to 30 harvests each year and will grow a customized blend of fresh produce for SIA’s Newark-to-Singapore flights starting in September 2019. As I reported last year in a farm-to-flight feature for USA TODAY, Singapore Airlines’ joins several other airlines in being super creative and eco about the food served on its flights. Korean Air has its own company farm. The organic, antibiotic-free meat from these animals, and from the farm’s flock of approximately 6000 free-range chickens, is sent to Korean Air’s flight catering kitchens in Seoul for use in meals served to first and business-class passengers. Some of the meat and eggs from the farm are also available, at premium prices, for purchase locally. In addition to raising cows and chickens, the ranch’s hydroponic greenhouse also produces more than 210 tons of fruit and vegetables, including red peppers, cherry tomatoes and blueberries for first and business class in-flight meals. In 2015 JetBlue created a 24,000 square-foot milk-crate garden outside Terminal 5 at New York’s John F Kennedy International Airport. Designed to both create a welcoming green space and promote local agriculture, the garden generates more than 2,000 pounds of blue potatoes, kale, carrots, leeks, arugula, garlic, mint, basic and other herbs for local food banks. In 2010, Japan Air Lines is scheduled to open an agritourism attraction on land near Tokyo’s Narita International Airport. The ‘JAL Agriport’ will offer visitors a chance to pick strawberries, harvest sweet potatoes, picnic, or purchase fresh produce grown in the region. JAL says it also plans to use some agriport produce in lounge menus and in-flight meals. And Emirates announced last year that it was joining with Crop One to build the world’s largest vertical farming facility near the airport in Dubai to help create a supply chain of “high quality and locally-sourced fresh vegetables, while significantly reducing our environmental footprint,”the airline said in a statement. A tasty trend for sure. Singapore Airlines has unveiled its new in-flight safety video, which not only reminds passengers of the safety procedures to be mindful of, but takes viewers on a panoramic journey across Singapore. In the video, passengers follow the Singapore Girl as she travels to landmarks such as Boat Quay, The Intan Peranakan Home Museum, River Safari, Haji Lane, Adventure Cove Waterpark, Henderson Waves, Capitol Theatre and Gardens by the Bay. On Friday, Oct 14, Airbus will deliver its 10,000th aircraft – the A350 XWB pictured above – to Singapore Airlines at the Airbus factory in Toulouse, France. On Saturday, this A350 delivery flight – SQ8895 – will take off for Singapore. Airbus bills the A350 XWB mid-size, long range aircraft family as “the world’s most modern and efficient aircraft family” with an “all-new efficient design” that includes “the latest and unique technologies improving performance in operation,” and making it competitive with the 787 and the 777 (made by, you know, Boeing). Stay tuned for more details as I’m in Toulouse for a tour of the factory and for the delivery ceremony of the plane. Lots to learn! Here’s a charming video from Singapore Airlines, which had San Francisco-based paper craft artist Luca Iaconi-Stewart make a model of the A380 out of 100 Manila envelopes. It’s all there – including the moving seats and the suites! Airline amenity kits filled with personal care items have been handed out to business and/or first-class passengers on long commercial flights since at least the 1950s. Utilitarian at first, today these chic containers and their posh contents have become coveted and collectible and are often designed by top designers and filled with luxury products. Here’s a look at some travelers’ favorite kits, past and present from the slide show I originally put together for CNBC Road Warrior. The SFO Museum has 355 airline kits representing 57 airlines in its collection. The earliest were called “Remain Over Night” kits and produced in “his” and “hers” versions by the Airline Textile Manufacturing Company (AirTex) based in Des Moines, Iowa. The men’s kit included deodorant, aftershave, hair cream, a razor, shoe polish and a comb. The women’s kit had hair spray, cleansing cream, hand cream and nail polish remover, according to the SFO Museum. Qantas, the flag carrier of Australia, partnered with Kate Spade New York and Jack Spade a couple of years ago to design exclusive amenity kits for customers traveling in the business class cabin. Each kit includes a selection of luxury Malin+Goetz skin care products as well as an eye mask, ear plugs, socks and other comfort essentials. Delta’s Tumi amenity kit gets high marks from frequent travelers for both its contents and its re-usability. “It stands head and shoulders above the competition, with a good range of products, including lip balm, which is always something I forget,” said John Walton at Routehappy. It can also “easily be reused to pack thing likes extra batteries or headphone cords,” said Chris McGinnis, of Travelskills.com. Sadly EVA Air has not created Hello Kitty-themed amenity kits to go with its fleet of Hello Kitty-themed aircraft, but when the airline introduced three brand-new Boeing 777-300ERs on its North America routes in the summer of 2014, it also introduced two new colors for its sought-after Rimowa amenity kits. Royal Laurel business class passengers receive one color on inbound flights and the other outbound. Contents complement the shells’ colors and include natural lip balm and moisturizing products by HARNN, lens-cleaning cloths and adjustable silk eye masks. 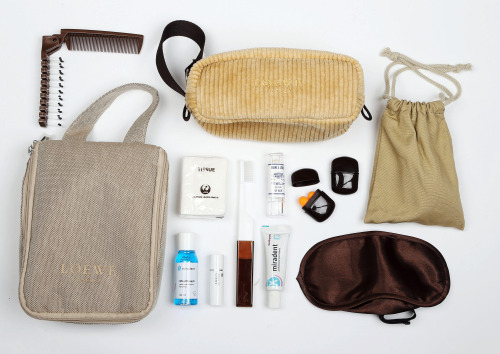 All the items in Japan Airlines’ kit for First Class passengers “were perfectly color-coordinated,” said Oonagh Shiel, the editor who recently led a review of almost thirty airline amenity kits for Cheapflights.com. “The toothbrush matched the hair brush and the eye mask and we didn’t see another kit with a built-in hanger,” which open up possibilities for after-flight use in a hotel or at home, said Shiel. The airline distributes a beige canvas kits on flights departing Japan and a camel corduroy version on flights headed there.